Pulley with metal clamp attached. Overall length of frame (pulley bar) 110 mm. Maximum clamp opening 25 mm. 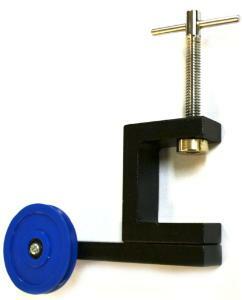 Bench clamp pulley 50 mm diameter pulley with metal ball bearing carried on a two part aluminum frame, designed primarily for clamping to the edge of a bench, table etc. With the pulley overhanging the edge and in a vertical plane. Overall length of frame (pulley bar) 110 mm. Maximum clamp opening 25 mm.